Room is dual aspect with views of the surrounding area, Newly refurbished with Twin Oak Beds, matching furniture and a new carpet. 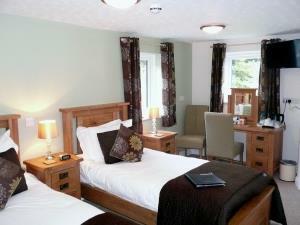 Extensive hospitality tray, organic toiletries, luxury bed linen, towels, large screen TV and free Wi-Fi are included. Avaialble for single night telephone bookings.